Both the story you know by heart, and a completely new experience. The classic 1951 version of A Christmas Carol rendered more faithful to its literary source via the removal of the events created specifically for the screen, and visually reshaped for a fresh viewing experience. 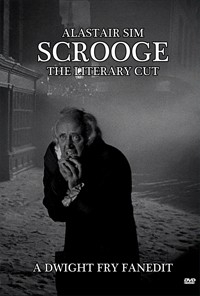 The widely beloved 1951 movie starring Alastair Sim is the definitive adaptation of A Christmas Carol for many people, yet it felt the need to expand upon the book by adding new sequences that in my view damage the balance of the narration making it lean too much towards the Christmas Past segments in detriment of the rest. The intention with this edit is constructing a more balanced narrative by removing those additions. Furthermore, a new visual style (which I will not spoil here) has been implemented throughout, based on an old idea of mine from way before I knew about fanedits, on a style that I always thought would fit this story perfectly and is how I would have filmed it. Not all changes from the book have been removed. If a scene was new but had an equivalent in the novellla, I left it in. Case in point: the fate of Scrooge's fiancee. It's different from the book's, but I left it because I'd rather have it than not have a "whatever happened to her" scene at all. Also, it must be pointed out that due to the particularities of this edit, it had to be created from an unrestored, unremastered source. As such, it looks somewhat battered and far from pristine HD. Hope you're forgiving about this aspect. -Cut Tiny Tim at the toy shop window. This is Scrooge's story, and this is the one scene that he is neither present in, nor witnessing, nor affected by. Plus, I really detest the character of Tiny Tim, even in the book, and would have cut him back further if I could. -Cut Mr Jorkin at Fezziwig's and meeting Scrooge. Mr. Jorkin, a character created for the movie, is completely removed from this edit. -Cut Fan's death scene. All that's relevant from it is learnt from the Ghost of Christmas Past earlier in the story. -Cut Scrooge meeting Marley for the first time. Can be taken for granted anyway. -Cut the boardroom scene. The kind of businessman Scrooge is is clearly established from the very opening, no need to elaborate. -Cut Jacob Marley's death scene. Not only is it unneeded, but I feel it works against the story in a way, as Marley delivering a warning to Scrooge before dying makes him coming back as a ghost much less poignant. -Cut the Ghost of Christmas Present's talk of "the child born in Bethlehem". Too much Christian propaganda. No problem with human characters being depicted as very religious, but a spirit delivering a mini-sermon is a completely different subject. What a great edit. 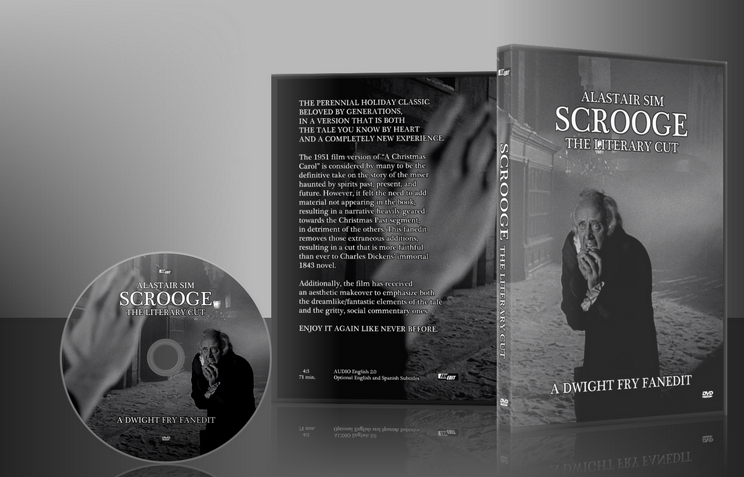 Scrooge is one of my favourite morality tales, and this edit brings out the best aspects of the tale. The use of colour was inspired and really helped tell the story in a unique and interesting way, and cutting out the unnecessary plot elements helped focus the narrative on the most important aspects of this classic story. And yes, the Tiny amount of Tim was also a good idea. Dwight Fry gives us a leaner, brisker, smoother version of Scrooge by hosing away all sorts of extraneous crap. Despite my distase for colorized films in general, I surprisingly found myself liking the strategic use of colorized sequences for certain parts of Scrooge's past and present journey. Dwight Fry chose just the right parts to inject warmth and color. This is now my favorite screen version of A Christmas Carol. Thank you, Senor Fry. This is another fantastic edit from Dwight Fry. The use of the color footage is quite inspired and the film feels much more balanced and easier to rewatch. I don't love the film as much as Dwight does (I especially think the colorized version looks like garbage) but this was immensely enjoyable. I watched this with my family on Christmas Day. It's been a couple years since I've seen the film, and much longer since I've read the book. Because of that I'm a little fuzzy on the original and what was cut, but suffice it to say there were no jarring cuts that brought attention to changes. Picture quality is what you'd expect from a 1951 film that hasn't been remastered. The transfer itself is fine for a standard release from this period. I did notice one video glitch where a black frame was missed between two cuts. Not major but it was there. I'm torn about some of the imperfect transitions and/or cuts that could have easily been corrected with today's software, but I assume Dwight Fry wanted to leave the film as much intact so I'm not marking off points for this as the imperfections weren't his doing but the original source. If I had been editing I probably would have corrected those jump frames at transitions. Again, personal choice. Audio editing was fine. Nothing noticeable. Overall enjoyment was 10. The edit moves along at a nice pace and nothing that was cut is missed. Nicely done! AMENDMENT: Dwight has confirmed the black frame mentioned above is actually in the source material and not due to something he cut.